Listen to win passes to see the award winning documentary “Bad Reputation”. 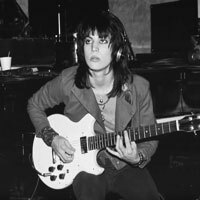 Joan Jett tells her story on the BIG screen, Wednesday, September 26th for ONE ADVANCED SHOWING ONLY, 7:45pm at the Kentucky Theatre. Special guests that appear in the film include: Pete Townsend, Iggy Pop, Debbie Harry, Michael J. Fox and many others! Listen for Kelli and Max for chances to win “guest list” passes!